There are 2 boardwalks (and a third one planned) in Stanley Park. They are in areas where it is ecologically sensitive and the area would be damaged if people walked on it. The longest boardwalk is located on Cathedral Trail. There is a short boardwalk on Tunnel trail. The planned third boardwalk will be at Beaver Lake. The Cathedral Trail boardwalk is a fairly long boardwalk which extends Cathedral Trail over a swampy area. In 2017, a metal mesh was put onto the boardwalk to lessen the chance of slipping. Where is the Cathedral Trail boardwalk? 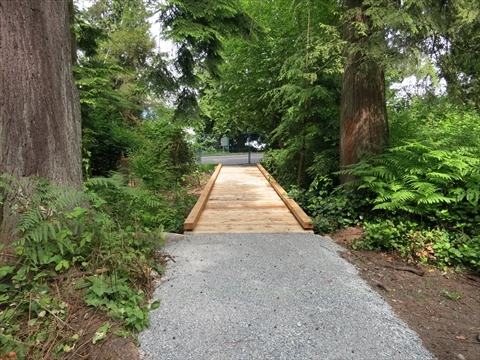 The Cathedral Trail boardwalk is located at the start of Cathedral Trail just north of the Duck Pond and North Lagoon Drive in Stanley Park. 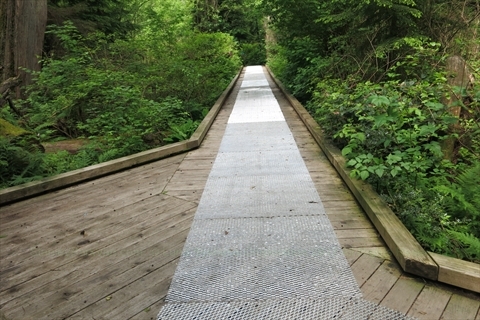 The Tunnel Trail Boardwalk is a short boardwalk that links Tunnel Trail with Stanley Park Drive. Where is the Tunnel Trail boardwalk? The Tunnel Trail Boardwalk is located at the very north end of Tunnel Trail on the north side of Stanley Park.